Our stay at Lakeview backpackers went above and beyond expectations for a hostel. Ronel and her team there are just amazing, are so helpful and fun! It was perfect for our days around flights in and out of Johannesburg, very close to the airport. The hostel itself is an older home retrofitted to be a cool hostel environment. If you are looking for a 5 star hotel, look elsewhere but if you are looking for a convenient location, very friendly and helpful staff, and a welcoming vibe then book here! 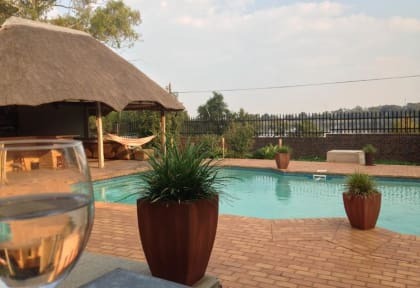 Perfect location for any late night arrivals or early mornimg departures from OR Tambo Airport. Spacious room with only a few beds was a nice change to typical dorms. Multiple lounge areas, big outdoor area and well equipped kitchen (supermarket or fast food options in walking dslistance). Bathrooms could do with a lick of paint, but strongest water pressure ever had in a hostel. 100% will stay again before my next departure flight. Lakeview Backpackers is a very relaxing hostel with a very friendly staff. The hostel is about 10 minutes away from the airport in a quiet safe neighborhood. Groceries are about a 15 minute walk away. Unfortunately, there were no lockers on the premise, but the location felt secure nevertheless. It is a great place if you are looking for a quiet place to chill or for a quick transfer to the airport. Just had a short overnight stay on a road trip but enjoyed staying here. We arrived fairly late in the evening, but the owner was friendly and accommodating. Place was clean. Would definitely stay again. The place is really good if you want to spend 1 night in Johannesburg and then catch another flight. The city is far away but the neighborhood is really safe and nice to walk. Ronel n Francois awesome couple and is a great place for travelers close to the airport.